Much has been written recently about the relative merits of taking an active approach or just letting your funds track an index. The growth of passive funds has been extraordinary. The head of Vanguard in Australia was in the news last week as the FUM have grown to $5.4 trillion. $2.9 trillion is tracking indices around the world. Vanguard has 20m investors around the world, with management fees on average 12bps. You can see how attractive these ETFs have become. Platinum Asset Management dropped its fees this week to 1.35%, still far higher. Transaction costs are key to keeping the costs down for ETF fund managers. Last year the team at Vanguard traded $100bn of stocks around the Asia Pacific region. Active managers have struggled in the recent bull market. 75% of local active managers have underperformed the benchmarks, including out MT Growth Portfolio and SMA. Now passive investing may be good in a bull market but what happens in a bear market? There are now questions emerging about whether we have reached ‘peak passive’. Currently 13% of investment dollars is in passive investment globally. The growth of the industry has coincided nicely with the post GFC recovery and subsequent bull market. The big unknown is how these funds will handle redemptions and liquidity in the event of a sizeable fall? The theory goes that the liquidity you see on the ASX screen is the tip of the ice berg. The fund manager will be able to handle large selling by buying the ETF and then unwinding the underlying instrument. Sure, there may be some difference in theoretical price and the actual price paid in the market, but for the long-term viability of the instrument and the institution behind the instrument it is in its interest to provide liquidity. That is the theory. There is a saying that everyone has a plan until they get hit in the face by Mike Tyson. But the ETF world of passive investment has not really been stress tested. Getting transaction costs down has been the key to their success. We talked last week about tracking error. These ETFs try to replicate an index or instrument, holding the least number of stocks to replicate that index. It does not want to rebalance every day as that would increase costs. The business is all about replication at the cheapest price. As such they own huge shareholdings in some of our blue chips. For instance, the BlackRock group has 86.9m shares in Commonwealth Bank or around 5%. This concentration of large positions poses no risk when things are going along fine. But one risk is the growth of leverage ETFs and exotic ETFs that promise exposure at cheap prices and other benefits. These use leverage and are somewhat opaque in nature and are more akin to active funds than passive. Pure index tracking funds are giving way to index tracking with bells and whistles. No point in five ETFs replicating exactly the same thing. Much better for business to add a little kicker or some leveraged alpha to the ETF. Maybe the investor though does not realise the alpha comes at a cost in terms of risk profile. This leads to more risk to the market generally. The risk grows when Mike hits you. 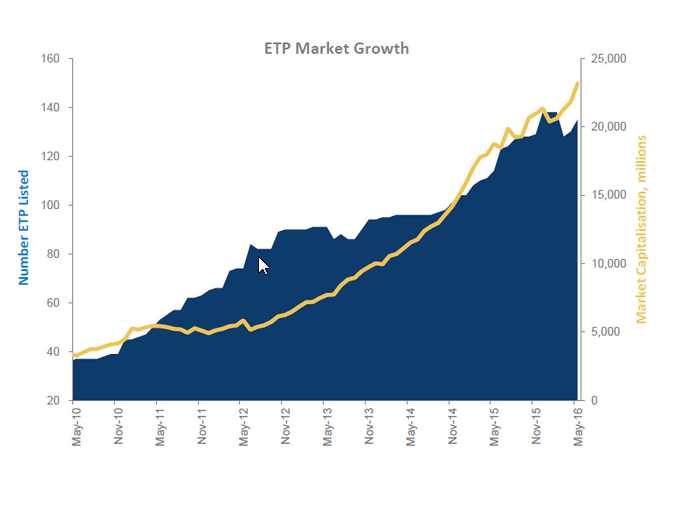 This gives you some idea of the growth of the ETF market since they were introduced to the ASX back in 2010. FUM in the Australian ETF industry in 2016 went up by $4.4bn year-on-year and hit a new all-time record of $25.8bn. Three fund managers run 70% of all US ETFs. BlackRock, Vanguard and State Street. And these index ETFs are traded aggressively especially in the US. State Street’s SPDR S&P 500 fund has daily turnover of more than $US14bn. The risk to our market is that we have far more concentration in so few stocks. Any ETF that tracks the ASX 200 can use far fewer stocks to get the same exposure. The issue then is definitely liquidity. With these huge orders in the system the only way to conduct the trades is via computers. They do not discriminate when it comes to selling. They just want to keep the portfolio in balance and arbitrage those sell orders to negate the risk for the fund. With active fund managers, they can use different tools to hedge risk, go to cash at times or suspend redemptions (Ausbil has done that recently) if circumstances dictate. ETFs cannot. They just track and when that punch falls, computers just start selling. So whilst everyone is happy to jump on the ETF band wagon, it does not mean that active is dead. Not by a long shot. There are times when passive will win out and there are times when active management will do so. Hopefully we will not have to stress test the ETF game in the near future but it pays to bear in mind the risks that lie beneath. It is not all low cost and performance. Bear in mind too that passive funds appear to be attracting a new generation of time poor Millennials who are not known for their attention span. 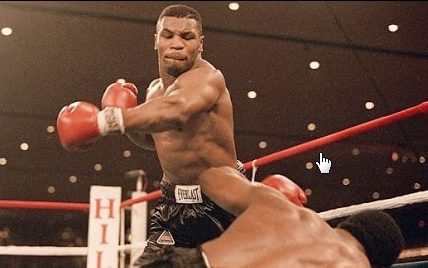 Something else to consider when Mike swings that left hook.